Hearts Beat Loud, the latest film from director Brett Haley, is one of those movies that gives away the entire story in the trailer, offering no real surprises from beginning to end. Nick Offerman plays Frank Fisher, a widower who owns a record store that’s on its last legs. His daughter, Sam (Kiersey Clemons), is about to head to medical school and Frank is struggling with the thought of being alone while also stressing about how to afford paying for Sam’s education. 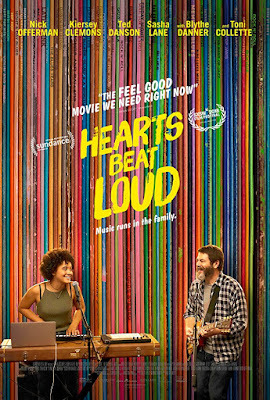 He bothers Sam while she’s trying to study for what he affectionately refers to as “jam-sesh time” and the two end up working out what will become the song of the film’s title, Hearts Beat Loud. Frank later learns how to upload songs on Spotify and Hearts Beat Loud gains some attention in an indie playlist, exciting Frank and puzzling Sam. I’ve started to grow tired of movies like this where we see montage after montage of characters coming together and creating music, jamming out, looking at each other with faces that read “this is so inspiring” and bopping back and forth their latest creation. I’ve seen it too many times before, at times done a lot better, and the same could be said of Haley’s work as a filmmaker. His previous film, The Hero, which starred Sam Elliot and was marketed as Elliot’s Oscar vehicle (it never happened, nor even came close), was truly awful. Whatever it was that audiences seemed to enjoy, I missed it, because the movie was, essentially, a poor man’s version of The Wrestler, with all the worst tropes and predicable beats included. In other words, Haley’s work tends to resemble that of better, more accomplished filmmakers, yet offers nothing new or surprising. 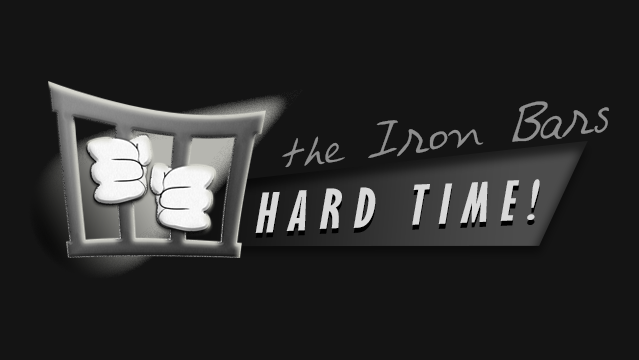 Instead his films tend to feel like “this” or “that” other movie that you remember more fondly. 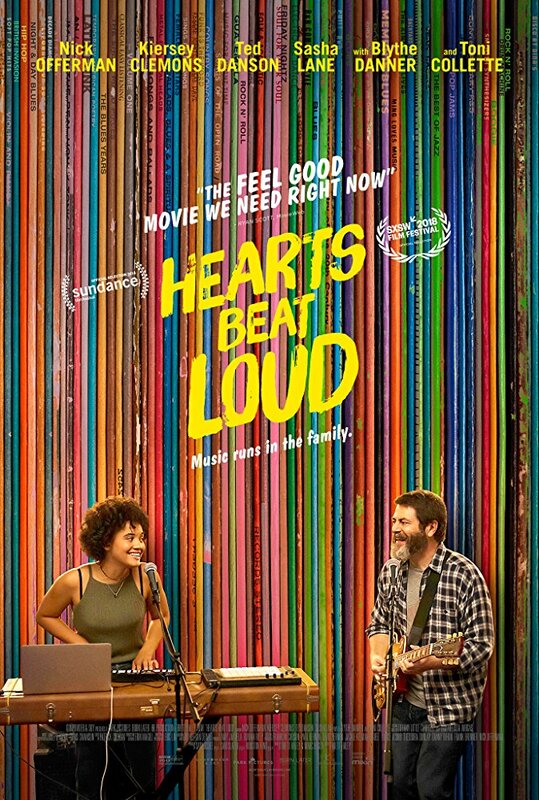 In this case, Hearts Beat Loud, tends to resemble the recent Band Aid from the vastly superior and talented Zoe Lister-Jones, about a couple who is constantly fighting and decide to turn their fights into songs. 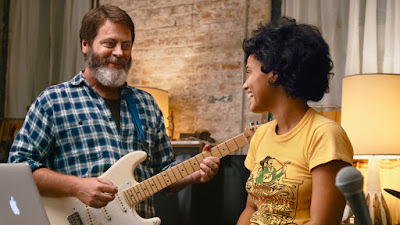 While Band Aid is also not without its flaws, it gets this type of movie – people coming together to create art, generally speaking – right, and succeeds in all the ways that Hearts Beat Loud doesn’t. It’s an unfortunate trend that I hope Haley can get out of, but as with most things in life, only time will tell. Hearts Beat Loud is not without its charm, however. Offerman does a good job playing a father who just wants to matter to his daughter, and Clemons shows that she has the goods to utilize in (hopefully) better movies. The music by Keegan DeWitt is catchy and fun, easily getting stuck in your head, perhaps annoyingly so, but serves its purpose. It’s just unfortunate that the trailer gives you everything you need to know, beginning to end, about Hearts Beat Loud. I had hoped that maybe Haley had more to offer this time around, but it’s not the case.